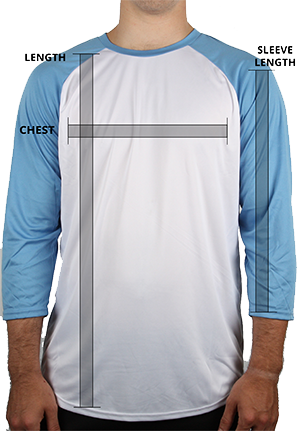 The ALSTYLE Raglan Baseball Tee is a 100% cotton tubular custom jersey with a classic raglan fit. With a raglan tee, there is no shoulder seam; rather, the seam runs from the underarm to the neckline. This allows for ease of movement and greater comfort. Contrasting sleeve and neck line colours create a sporty look and added visual interest. This classic baseball custom t-shirt is pre-shrunk to minimize shrinkage when washing. Place one end of the tape measure under your arm and measure end to end. Round up to the nearest half inch and mark the measurement. Sleeve Length: Start at the centre back of the neck, measure across the shoulder to the elbow and down the arm.